Facebook Live, first introduced in the summer of 2015, has become a popular way for users to create videos and engage with friends and family. In its beginning, Facebook Live was only an option for celebrities, but now anyone with a Facebook account (and a decent internet connection) has access to it, and users are taking advantage of it in a variety of fun and creative ways. Entrepreneurs have found Facebook Live to be a great way to promote their business to new and existing audiences, and those successes speak volumes. Continue reading to learn more about best practices when using Facebook Live, as well as ways to incorporate it into your marketing plan. Facebook isn’t the first company to provide live video streaming to users; Periscope, MeerKat, and YouTube have been doing it for much longer. So what makes Facebook Live different (and better) for businesses? Facebook has 1.1 billion daily active users. 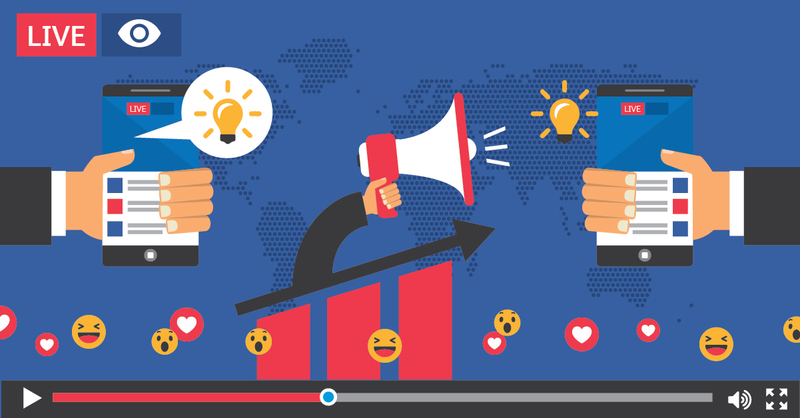 Facebook also shared in a blog post that people “spend more than three times more time watching a Facebook Live video on average compared to a video that’s no longer live.” With live video, you reach a larger audience. Facebook’s algorithm gives priority to live videos in the News Feed, making your video more likely to be seen by your friends and family (and other followers) than a regular status post or photograph. Unlike Periscope and MeerKat, Facebook Live has customizable privacy filters, so you can choose who sees your video. This is great for business owners who create specific videos to target different audiences—a highly recommend practice. Unlike Periscope and MeerKat, the video doesn’t disappear when you’re done filming. Once you’re finished, the video is posted on your timeline and will stay there permanently, or until you choose to remove it. This gives consumers a chance to view the video even if they missed the live session, and it gives you the option to share and promote your video on your blog and other social media sites. In general, people have short attention spans (you may be familiar with the goldfish statistic). Live streaming is a good way to attract users and keep them engaged, even if it’s only for a short period of time. Live videos can be edited. Include an engaging headline and a detailed description, and don’t be afraid to incorporate keywords. Post your video to your blog or website, and use it to boost your SEO. Before you jump in and start streaming, consider the following best practices for Facebook Live. Plan what you’re going to say ahead of time. If you don’t, you may get distracted or lose your train of thought during the video, and this may confuse (and disengage) your audience. Plus, you don’t want to give the impression that future Facebook Live videos will be disorganized.